How do I create point features with exact (manually entered) coordinates in QGIS? I get precise GPS coordinates from a survey team which I need to add to a point layer. What I want: -Add point, type in the coordinates and when pressing enter the point is created where it is supposed to be. This is possible with QGIS without extra plugins using the Advanced Digitizing panel. This tool allows entering exact coordinate values as well as constructing points at given distance and angle from other points. The advanced digitizing tools are not available in geographic coordinates. Pictures taken from this excellent answer which gives a walkthrough. You need to install the 'Numerical Digitize' plugin first. Then you can use Numerical Digitize command to Create points in QGIS with exact (manually entered) precise coordinates. 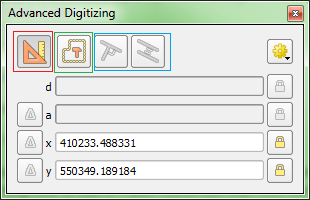 The Numerical Digitize command is found on the Digitizing tool bar. Make sure your Toggle Editing is on for the layer you want to digitize (add coordinates to), so that Numerical Digitize button will be active. You can do this for both point and polygon data. and a window comes up asking you which columns to use as X & Y coordinates and other options. Edited to add: see also this tutorial linked at the QGIS Wiki. This is less fiddly for multiple features than the Advanced Digitize Plugin. You could abuse the 'Azimuth and Distance' plug-in to do this. Enter the x and y ordinates in the 'Starting vertex' boxes and press 'Draw'. The point shapefile has to be in edit mode. I'm not sure which repository has this plug-in, but a Google search will find it. If you're entering lat/lon coordinates remember that lat is 'y' and lon is 'x'. N.
Simply have a look at the plug-in's official README, section "Points Digitizing Tool", to get started (actually, the whole process is rather self-explaining). What format do your surveyors use to give you their data? Ours can give me a .dxf file which I can drag onto the QGIS canvas. That contains points, lines and polygons, so I am asked what I want to import. I can select them all and QGIS gives me three files. I simply save the points layer into a shape file and I have all the exact points I need. If you don't have yet, create a new point layer. Even a temporary/scratch layer is fine. Add fields for X, Y coordinates and possibly other attributes. Add features, setting at least the coordinate attributes. At this point these features will have no geometries. Another way: If you have the GPX file, just move into your QGIS window. Then add "waypoints". Not the answer you're looking for? Browse other questions tagged qgis point coordinates or ask your own question. How to digitize building footprints with orthogonal edges? How to create a polygon using coordinates?